In 2015 Sadmon Projects and Consulting was awarded a three-year, R352 million communications contract by the Department of Health. The tender was for an external service provider to run a mass media communication and social media mobilisation campaign. The emphasis was on “mass”, and a successful social media strategy was therefore critical. Sadmon refers to itself as an “owned online media channel for the NDoH to promote, educate and generate awareness of public health programmes”. This essentially means that Sadmon ran certain of the department’s social media accounts such as the department’s twitter account (@HealthZA). A section in each of Sadmon’s monthly deliverable reports is dedicated to “measuring and monitoring digital platforms”. Spotlight obtained Sadmon’s monthly reports through a request in terms of the Promotion of Access to Information Act (PAIA). From August 2016 Sadmon started implementing a social media strategy. The daily posts focus on a range of topics – often aligned to specific health awareness days in the Department’s calendar. The strategy is described as being developed around a content plan and “live social activation support” – tweeting and posting from events. What seems abundantly clear is that despite Sadmon’s pages and pages of monitoring reports, their much-vaunted social media strategy was relatively ineffective when compared to other government departments. In addition, health is arguably one of the easier government departments for which to build a social media following given its direct impact on the lives of all people in South Africa. It is hard however to assess whether the Department of Health received value for money for Sadmon’s social media work, since the department declined to provide Spotlight with invoices that would show what part of the R352 million budget went toward social media management. An analysis of the first six months of reports on their social media strategy provides some insight into how effective or ineffective their work really was. In August we see the first references to “content plans and crafted text posts”. The content plan in the deliverable report focuses on publishing two posts per day on various topics – including breastfeeding, HPV vaccine and condom use. The month-on-month increase in Twitter followers is 608 and Instagram 8. There are 328 more Facebook (FB) likes. The overall “mentions” are 4 262, but the highest number relates to a Mail and Guardian article on Julius Malema’s weight loss, which included a bizarre call by the KwaZulu-Natal ANC for the Health Minister to investigate. The story created a flutter on Twitter, and this contributed to the bulk of the social media activity. Considering that overall mentions were only five more than the previous month, Sadmon’s “digital strategy” does not seem to have gotten off to an auspicious start and there was no meaningful increase in social media engagement in the first month. Facebook likes are up with 344, Twitter followers by 564 and Instagram by 34. This growth, according to Sadmon, was attributable to their digital team’s involvement. The spin does not live up to scrutiny, however. The overall mentions are 4 266 – 4 more than August. Moreover, once again, the bulk of these was from Twitter and related to an event that had nothing to do with the social media strategy itself. Then Deputy President Ramaphosa had introduced Max condoms in parliament with a forthright endorsement that they provided maximum pleasure and made “less noise” than the previous government condoms. It caused a sensation on Twitter. Two Sadmon-generated posts made it onto the Department’s “top 5” for the month. The first, introducing the condom “flavours” received 57 “engagements” while a second, on the availability of the new condoms at clinics, received only 14. In the last weeks, two significant new stories push mentions up with 1 000. The Minister vows to get to the bottom of the Life Esidimeni tragedy and the Johannesburg Mayor taking government department’s to task for unpaid bills. Once again the spike is extraneous to the bespoke messages being pushed out as part of the social media campaign. Facebook likes are up with 281, Twitter followers by 450 and Instagram with 26. The top Twitter post for the month, with 22 “engagements” reads: “Today is Mental Health Day. The objective is to raise awareness of mental health issues making mental health care a reality worldwide”. The less-than-gripping content is accompanied by a graphic showing a skeleton with a red brain. It is also important to note that spikes in social media engagements aren’t necessarily a positive reflection on a media strategy. So, for instance, a significant amount of social media activity for the month related to a media article in which the Minister links the importance of free education to the NHI. This elicited significant negative sentiment. Facebook likes are up with 736, Twitter followers by 1 043 and Instagram with 54. The content plan for November is broken down into 1% generic messages, 90% for health awareness days, 3% MomConnect, 1% SA Demographic survey and 5% on Max condoms. The Top twitter post receives 21”engagements”. Once again, the highest number of mentions relate to a media article completely unrelated to the social media plan – or even health. This time the Health Minister is mentioned in this Business Day article: “Fellow Ministers back Hanekom as ANC meeting on Zuma continues”. Facebook likes are up with 522, Twitter followers by 934 and Instagram with 46. Social media mentions peak at 794 on the 1st of December during the live coverage of the World AIDS Day event. The top post for the month generated by the Department garners only 16 “engagements”. Facebook likes are up with 322, Twitter followers by 698 and Instagram with 39. Overall volumes are down from December by almost 300, and engagements with 260. Once again, the highest number of mentions relate to a sensationalist media article in which the Minister says new doctors marry in December to avoid rural postings. 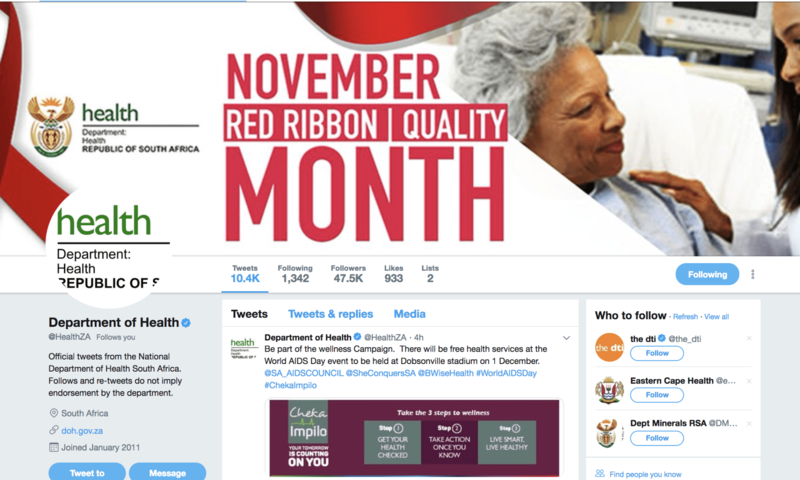 While Sadmon’s management of the Department of Health’s twitter account is not disastrous, there is little evidence of the kind of sophisticated social media campaigns one would expect as part of a R352 million contract. The evidence also shows that the Department of Health has not done particularly well on social media when compared to other government departments. In response to questions sent to Sadmon CEO Cyril Sadiki, Sadiki was dismissive of the suggestion that Sadmon did not provide the department of Health with value for money. Other parts of this series of articles contain more comment from Mr Sadiki and the Department of Health. This is part 5 of a five-part series investigating the Department of Health’s R352 million contract with Sadmon. There with be further follow-ups next week.